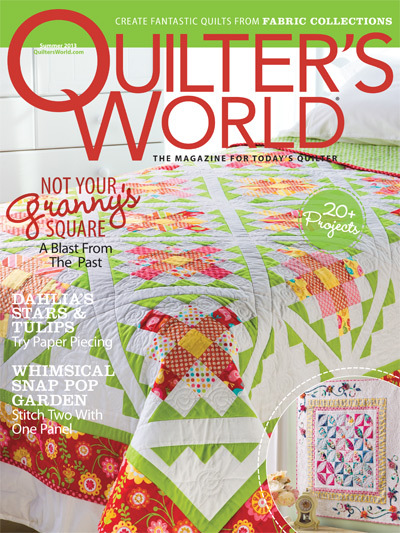 Hello Friends, I am happy to share with you that little quilt at the corner of the cover of Quilter’s World‘s Summer 2013 Issue is designed and made by yours truly – it’s my Garden Mist quilt! This small wallhanging / table topper was a fun one to make because of the various techniques involved – regular piecing, my “faux” curve-piecing, fusible applique, and three dimensional yoyo flowers. 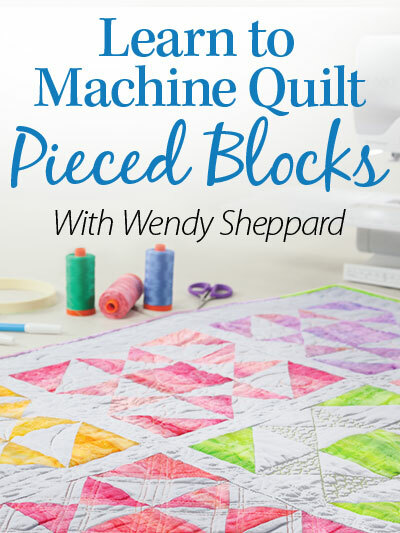 It was designed with “trying out techniques” in mind so that one can have experience in attempting the different techniques without having to make a big ol’ bed spread size quilt. My ‘faux” curve-piecing technique was achieved by applique-ing the orange peel pieces onto square blocks. You can see the white I used is sheer, causing the background fabric to peek through the white, and thus giving the overall look a “misty” effect. Click here and here for my previous posts on machine fusible applique. And here you see the yoyo three-dimensional flowers. I just love these flowers made using Clover’s yoyo makers. Click here and here to see the particular ones used to make the flowers. I also decided to use “other than green” fabrics for the leaves and stems. I quite like the visual effect of using prints for stems. 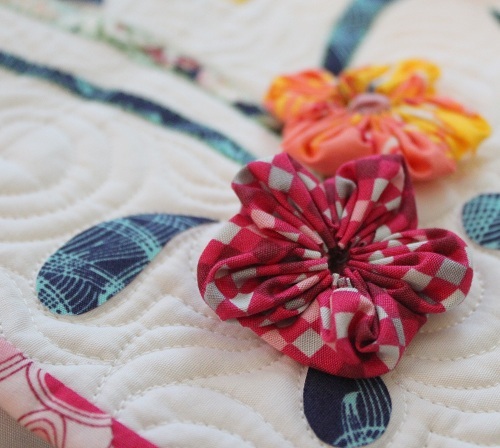 The fabrics used for this quilt are from Art Gallery Fabrics. They have a nice selection of floral prints with a contemporary flair! Check them out if you haven’t already. The design of this quilt is meant for quilters to freely choose the fabrics they like to suit their own palette of choice. Now about the quilting – except for the straight line quilting, everything else is unmarked free-motion quilting. As usual, the supplies used are Aurifil Mako 50 cotton thread over Hobbs Tuscany Silk batting. This following shot was taken right when the sun was rising – you can see the sun rays peeking through in the top left corner. I was able to sneak out for a little walk before my little family woke up. Thank you for stopping by. I hope you have enjoyed my Garden Mist quilt. Do tell me what you think of it. Meanwhile, I am going back to work. I have eight quilts to ship out in the near future. I am on my second one…. 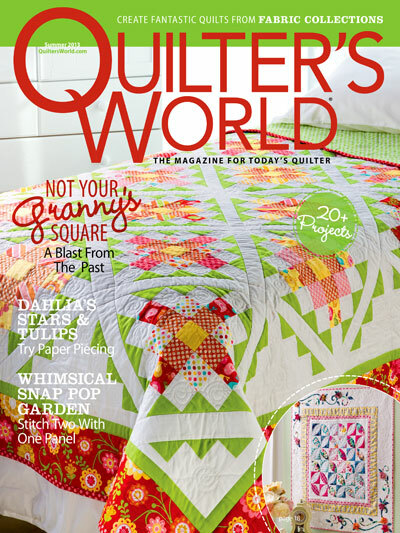 This entry was posted in Quilt Pattern, Quilting, Quilts & Projects: Published, Quilts: Pieced & Applique and tagged Art Gallery Fabrics, Garden Quilt, Quilter's World Summer 2013, Wendy Sheppard Designs. Bookmark the permalink. 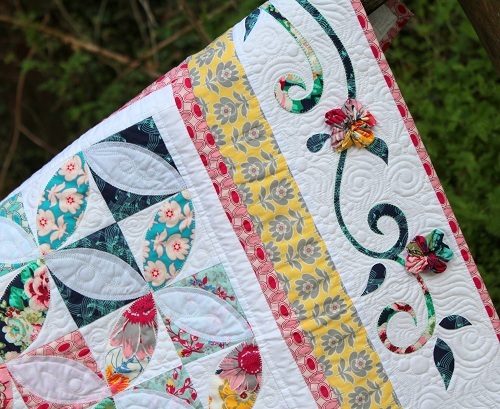 What a beautiful little quilt Wendy – love it ! LOVELY! 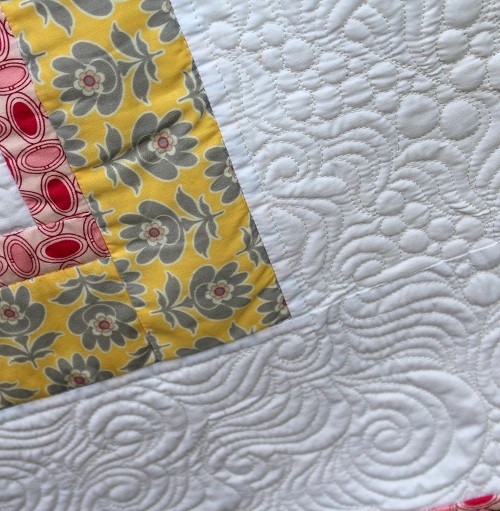 I like the close ups of the quilting. I always like to see that. the quilt is darling too. ABSOLUTELY GORGEOUS!!! You share and give such encouragement!!!! You are an inspiration!!! I love love love your quilt. It is so refreshing. I must run out and add to my magazine collection. 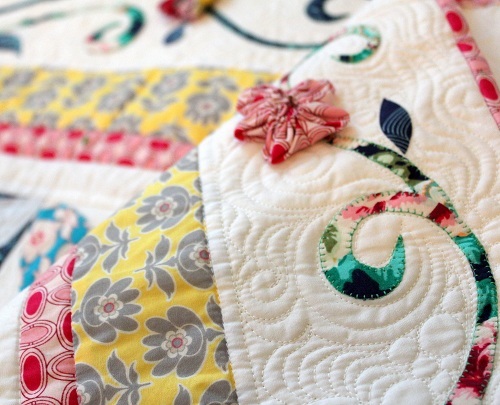 Wendy….this quilt is beautiful…it’s a “happy” quilt! Love it! Thank you for sharing and giving me inspiration! You absolutely blow me away with how much you get done. I know they are small where I make big ones and don’t quilt them. You are one awsome lady! 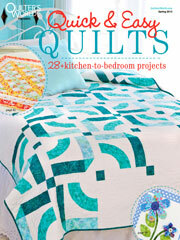 I love the quilt and can’t wait until the magazine comes, so I can check it out and use the parts for a table runner. Thanks for sharing. I LOVE it Wendy! The colors and design are fabulous and the dinensional flowers are stunning. A winner all the way around. I love the “scrappy” look! You are so talented and such an inspiration! In fact, I will go hand-quilt right now! Do you ever hand-quilt? Your quilt is stunning. 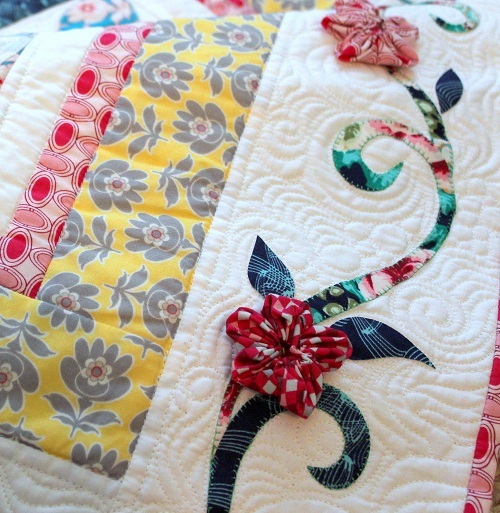 I love how you quilted it and the embellishments on the border. 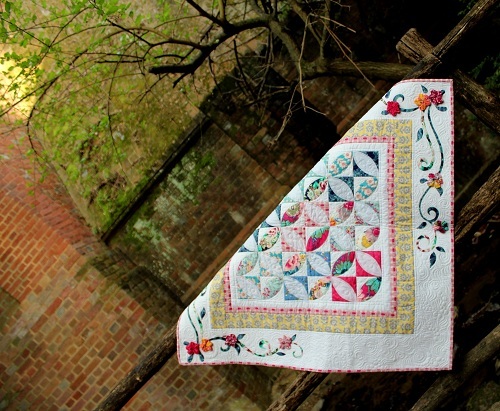 This quilts reminds me a little of my tea leaf quilt. Wish I could quilt like you do as I really had a time with mine. You have a beautiful quilt. Beautiful quilt. I love the orange peels. I have a template. The curved piecing is not bad, actually. I LOVE the quilting. 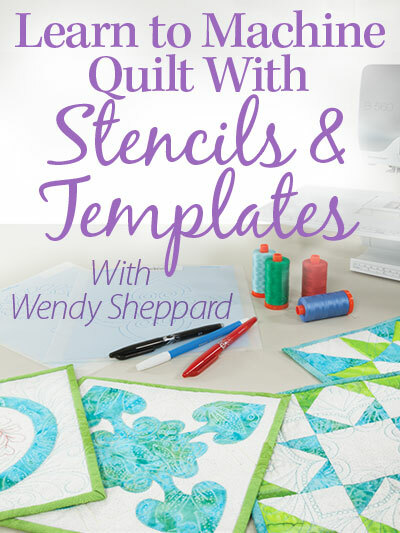 Do you teach quilting? I know you don’t travel, but I could come there. I would be willing to help organize a retreat in Galveston, Texas if you are interested in vacationing down here at any time……lol You are phenomenal and I feel blessed and inspired to read your posts and see your quilts! Very nice! 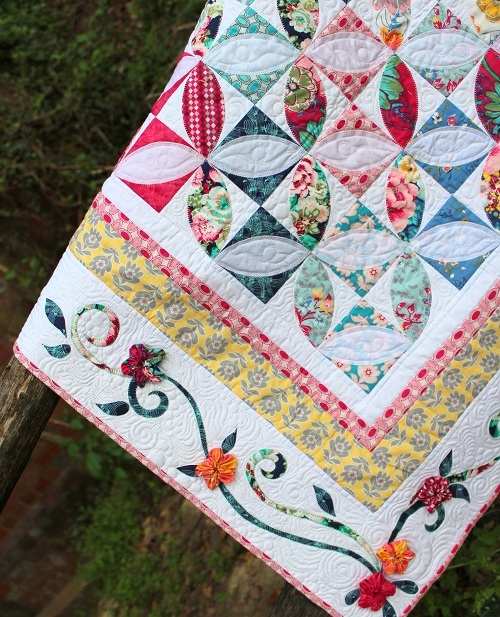 Love the border and especially the patterned fabric for the leaves and stems. Absolutely love it! I would attempt this one! 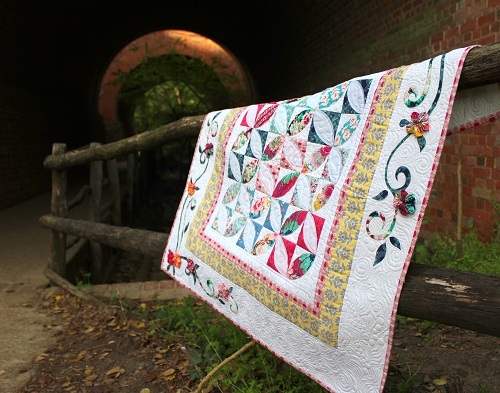 I am very partial to little quilts and this one has so many interesting facets that it wouldn’t bore me like regular piecing does! Great job!!! What a happy quilt. I love the orange peel and borders and the colorful fabric. I will give this one a try. Thanks for sharing and being such an inspiration. LOVE it! Going to have to pick up one of those yo yo makers, always did just the round ones, love the flowers. Beautiful and cheerful…..a work of art. I love the yoyo flowers! Great quilt! I’m a big fan of designs that let you stretch your tehnique muscles a couple of different ways so may have to try this one some day. 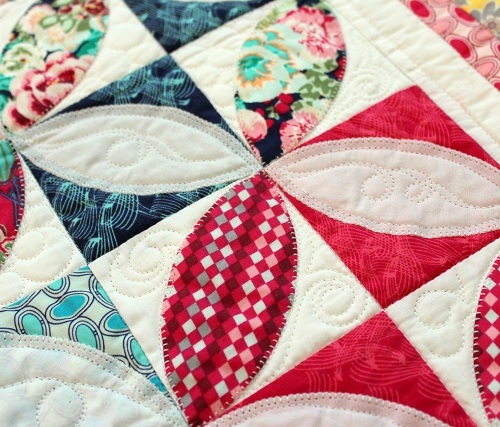 As always, love the way you quilted it too! This is an absolutely beautiful quilt and quilting. A lovely mix of different techniques! 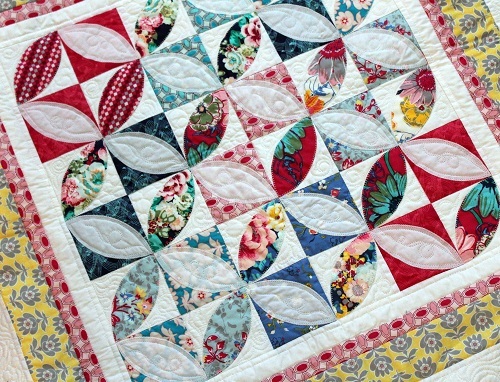 Gorgeous quilt!Thanks for sharing. 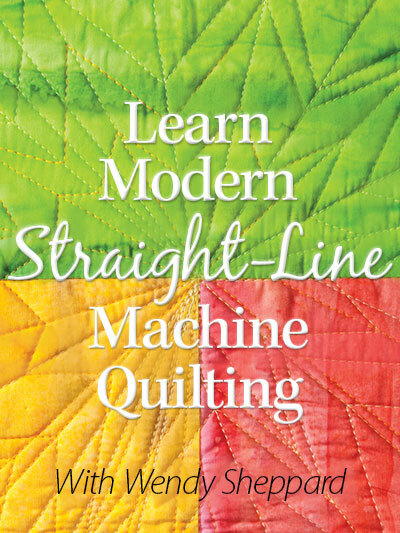 I also bought your Learn to Machine Quilt class and I love it. Wendy, your quilt gives me such a happy feeling. I like everything about it. Fun that it has “sew” many techniques in one small quilt. Thanks for continuing to inspire and to share. 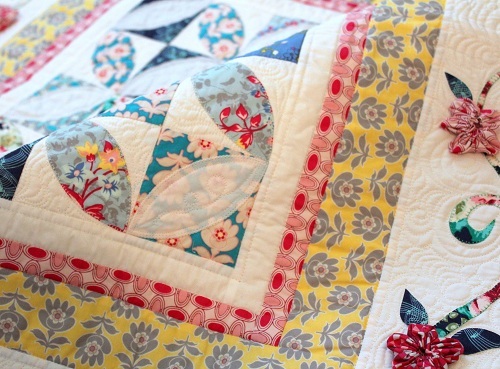 Very pretty quilt! 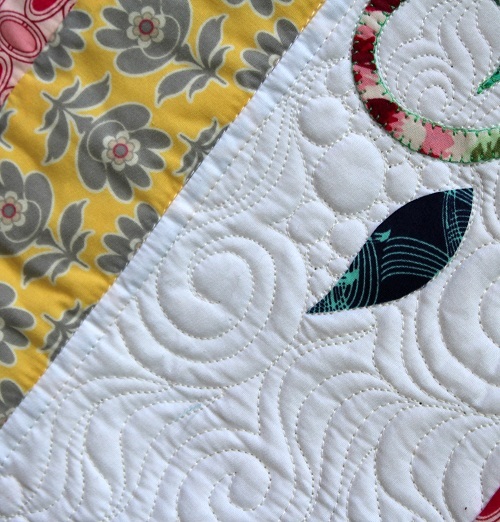 I love the different styles of the quilt and quilting, such a fun quilt to look at! Garden Mist is gorgeous and so creative! Love this quilt! I’ve always loved Art Gallery fabrics; they have such a wonderful, smooth feel to them! I think your patterned stems are genius…so much more fun than plain green! One of my first quilts had 63 yo-yo’s on it and I haven’t made any since…but I think I have the flower templates you used. Now you’ve got me thinking about a couple of my to-do quilts that would really be perfect to add some 3-D flowers to. Have a wonderful, productive weekend! This is pretty. Love the colours. Beautiful quilt and I always love to try new things! This is gorgeous, Wendy. I especially love the unique touch of three-dimensional yo-yo flowers on the border. 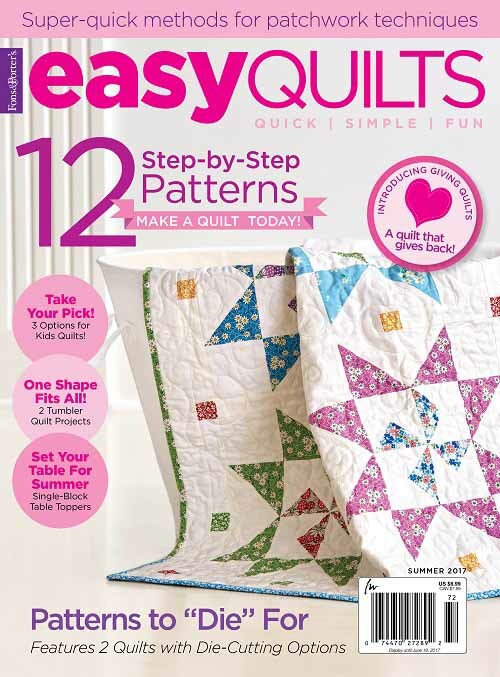 I’m wondering if the pattern is available for this quilt, or is it only in the magazine? I’d love to make it!